In a complex region with tensions that debatably go back to the era of our biblical forefathers and mothers, it is difficult to get a handle on the modern-day issues of the Holy Land. In preparation for our call as communicators of the work and ministries of the Evangelical Lutheran Church in Jordan and the Holy Land (ELCJHL), I have had to do a little independent study. While feverishly pouring over resources, I thought my community of supporters may want a little brush up as well! The following are resources from a Lutheran context. resources, here. How was the checkpoint today? As former journalists, Ben and I have a hard time blindly accepting the written word on any subject as final and without skepticism. Anybody can be the expert online and many proclaim to know it all, but know little about accurate, fair and timely coverage, and even less about being non-biased. With a topic as sensitive as the Palestinian-Israeli conflict, the available neutral news sources gets real slim, real fast. Remember that what you are reading will have an agenda or a slant to one side or the other. To be Christian means to seek a different way, a third way, a way that is not black or white, this or that, but presents realities that allow the reader to find her own way. 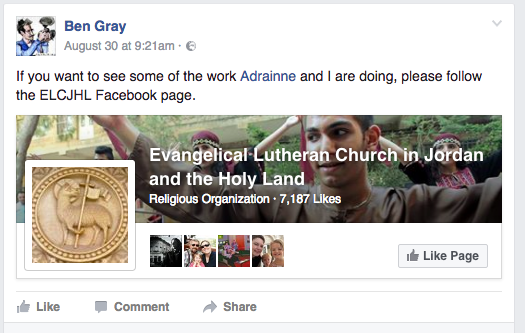 Disclaimer: The opinions expressed by thegraytones.com, runographer.com and those providing comments are theirs alone, and do not reflect the opinions of the ELCA, ELCJHL or any organization, thereof.